Nucleus​ is a membrane bound structure that contains the cell’s hereditary information and controls the cell’s growth and reproduction. Nucleus is present in all eukaryotic cells, they may be absent in few cells like the mammalian RBCs. The shape of the nucleus is mostly round, it may be oval, disc shaped depending on the type of cell. It is the command center of a eukaryotic cell and is commonly the most prominent organelle in a cell. The nuclear envelope is a double membrane that separates the nucleus from the cytoplasm. All traffic into and out of the nucleus passes through nuclear pores that bridge the double membranes. Inbound traffic includes all nuclear proteins and ribosomal proteins destined for the nucleolus. Outbound traffic includes mRNAs and ribosomal subunits. The nuclear envelope consists of phospholipids that form a lipid bilayer. The nuclear envelope is perforated with numerous pores called nuclear pores. The envelope helps to maintain the shape of the nucleus and assists in regulating the flow of molecules into and out of the nucleus through nuclear pores. The nuclear envelope is connected with the endoplasmic reticulum (ER) in such a way that the internal compartment of the nuclear envelope is continuous with the lumen of the ER. Chromosomes consist of DNA, which contains heredity information and instructions for cell growth, development, and reproduction. When a cell is “resting” i.e. not dividing, the chromosomes are organized into long entangled structures called chromatin and not into individual chromosomes. Nucleoplasm is the gelatinous substance within the nuclear envelope. 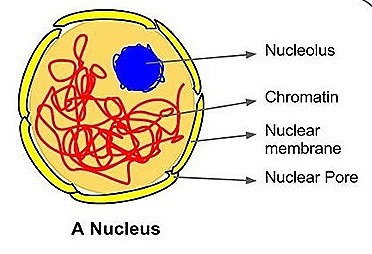 The nucleolus is not surrounded by a membrane, it is a densely stained structure found in the nucleus. It controls the heredity characteristics of an organism. It main cellular metabolism through controlling synthesis of particular enzymes. It is responsible for protein synthesis, cell division, growth and differentiation. Stores heredity material in the form of deoxy-ribonucleic acid (DNA) strands. Also stores proteins and ribonucleic acid (RNA) in the nucleolus. It is a site for transcription process in which messenger RNA (mRNA) are produced for protein synthesis. It helps in exchange of DNA and RNA (heredity materials) between the nucleus and the rest of the cell. Nucleolus produces ribosomes and are known as protein factories. It also regulates the integrity of genes and gene expression.